You’re in a room. The room looks familiar. Kind of. It’s your grandpa’s rec room combined with his garage. People start crowding in. The room seems to get smaller. Then suddenly... bam! You’re eating a sausage. You don’t have to be Dr. Freud to explain it. You’ve simply had a premonition about Off Site Bar, the new storage-locker-sized adjunct bar from the Longman & Eagle gang, opening tomorrow. For a place that’s only 150 square feet, they’ve packed a tremendous amount of action into a cinder-block former garage. So there are a number of reasons why you may just want to wedge yourself in. First, come here when you’re going to Longman & Eagle and waiting for a table. It’s just around the corner, so you’ll go in, have a cocktail and not worry about missing your name being called. Second, come here when you’re not going to Longman & Eagle. You know: when you just need a night knocking back whiskey next to a drag-racing motorcycle. 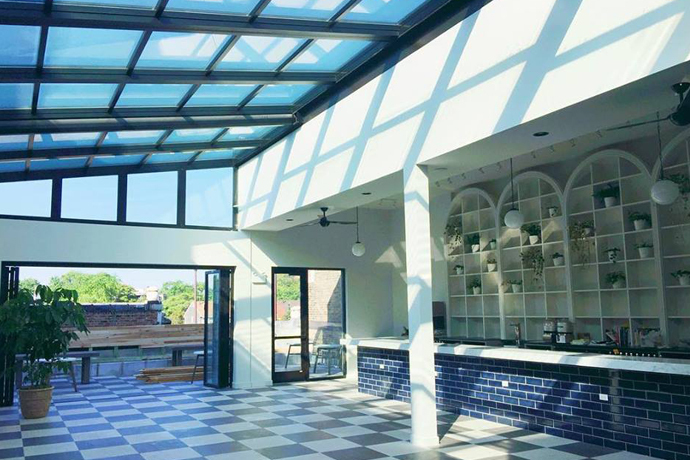 Third, in about two weeks, the space will launch Saturday Sausage Shop, a weekly pop-up featuring two or three sausages made in-house by the sous-chef. Whiskey and sausage brunch for St. Pat’s: it’s happening.